Descent 267 is now available! 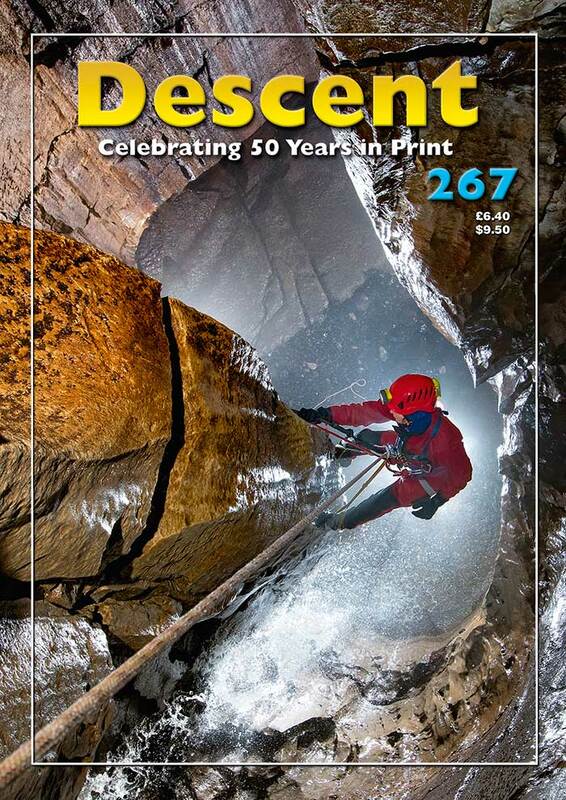 If a copy hasn’t arrived with you, it’s time to head over to Wild Places Publishing to subscribe now or if you’re lucky enough to have a caving shop anywhere near you, call in and get a one from them. Descent is the best way to stay in touch with what’s happening in the caving world both home and abroad. So don’t miss out! Newsdesk is as packed as ever. Martin Dold is doing his best to make caving accessible with an ambitious project to fund the creation of an artificial cave in memory of his brother Paul who died while sea diving in 2016. The hope is to raise a target of £110,000, and a donation of £3,000 has been made by the Hidden Earth team from the surplus they make from the conference. Cave art is in the news with the discovery of some new handprints in Altamira in Spain, and over the border in France a somewhat fanciful theory has been put forward which attempts to align the dots and other markings in caves to a system to keep track of time using the stars. Science is helping to shed more light on the prehistoric artists and in Spain they think that bovine albumen was smeared on the walls some while before painting started. BCRA have two field meetings coming up, one at Poole’s Cavern in Buxton on 27th April, the other is on 28th-30th June at Alston in Cumbria on the subject of hypogene caves of the north Pennines. Descent reached a major milestone with its last issue and Wild Places Publishing have set up a new website for the magazine, and are in the middle of a housekeeping exercise to check all links are working and you can now subscribe to a Descent newsletter, so hop over there and sign up. It’s very easy! Father and son diving partners Michael and Robert Thomas found an intact Roman flagon whilst following a line through the Wookey Hole sumps. This was brought to the surface and will be displayed in the museum at the caves. For the eye-watering price of 10,000 euros, you can spend several days down a cave in Cantabria, Spain, receiving the sort of training astronauts get as part of their training to go to Mars. Closer to home, ritual protection marks have been found at Creswell Crags on the Derbyshire/Nottinghamshire border. The find, by Hayley Clark and Ed Walters of the MCG generated huge press interest and a range of ‘witch marks’ merchandise is now available including biscuits! The aftermath of the Thailand cave rescue continues with a huge effort to recover the vast amount of kit abandoned in the cave during the successful extraction of the children and their football coach. The defamation action brought by British caver Vern Unsworth against Elon Musk continues, as Musk failed in an attempt to get the suit thrown out. In news from the north, Descent reports the sad death of Richard Bowerman (aged 52) one of the owners of Stump Cross Caverns. A substantial rockfall has occurred in Jingle Pot in Chapel-le-Dale, and an earthquake is a possible culprit. In the Peak District, exploration in Muse Mine has revealed various mining artefacts such as the remains of an old cart, and a survey has been produced. Rob Eavis reports on some work in Geology Aven in Giant’s Hole. Access to Devonshire Cavern has been reinstated and work to facilitate this, including the removal of some fallen tress has been undertaken. Further south, on Mendip, digging and climbing continues in Reservoir Hole, and the annual bat count in the caves of Fairy Cave Quarry, some long-lived Greater Horseshoes were noted, one 27 years old, and another at least 12 years old. On the other side of the Severn Estuary, the woodland that includes the entrance to Otter Hole has changed hands and cavers there have now established a relationship with the new owners, and it is hoped that access will continue to be granted. Jan Karvik has been given the Jim Hey Award for his re-taping work in Otter Hole. Successful photographic workshops were held in Old Ham Mine and Bixhead Stone Quarry and work continues on the hydrology of the Forest of Dean. Cavers all over the country have lamented the death of Colin Coventry who for many years took trips in Smoo Cave by boat. Alan Jeffreys writes about Colin the Caveman, as he was known to so many people. In news from Ireland, Petie Barry reports on the addition of over a kilometre of new cave in Shannon Cave, Co Fermanagh. Frank Pearson tells the story of the winter dig at Marble Steps Pot in a lavishly illustrated article which includes a survey. Also in the north, there’s a description of the new Rigging in Quaking Pot, along with some rigging topos. There’s a summary of the cave rescue statistics for 2017, along with summaries of the type of injuries and incident causes that have occurred over a ten year spread. Further afield, David Gill gives an account of his explorations in Gunung Buda in Malaysia, and reports that work is underway to develop the tourism potential of the area, even though there are no proposals to establish new show caves, but types of wild caving experience are under consideration. Martyn Farr has been diving on Lanzarote and tells the story of the Atlantida Tunnel. In the Speleo Reader section there are reviews of The Cave, a book on the Thai cave rescue that comes highly recommended, and David Drew’s book on the Karst of Ireland. Historic England have produced a book on The Archaeology of Underground Mines and Quarries. There’s also a round up of other publications. A new book has been produced on Northumberland, one of Britain’s lesser known caving areas, so there’s no excuse for not paying them a visit! Every issue of Descent is superbly illustrated and this one is no exception, with a stunning front cover by Mark Burkey showing Jane Allen in Heron Pot, and on the back cover there’s one of Lisa Wootton in the entrance of Eldon hole by Clive Westlake. Descent is produced by cavers for cavers and is excellent value for money. Copies can be obtained from Wild Places Publishing. If you’re not already subscribing head over to the website and sign up, and if you are already a reader, check that yours is up to date!